Building your real estate investment "Dream Team"
You know the old saying, “behind every great leader is a great team”… Well, it’s true. Ask the world’s most successful business people – including real estate investors – for their secrets and there’s a huge chance that all of them will list “the right team” as one of the biggest factors to their success. No one who’s truly successful does it all themselves. If you want to catapult your real estate investing business to the next level and find the kind of financial and professional success you’re looking for, you need to assemble a team of experts to support you on the way. 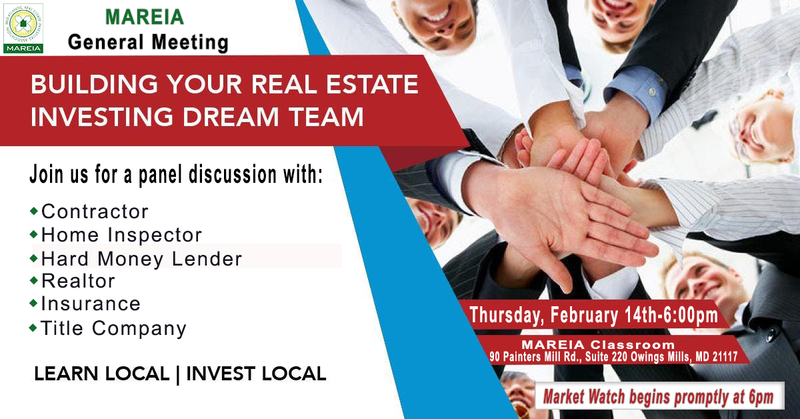 Join us at the upcoming February MAREIA General Meeting, we are bringing in some of our personal "Dream Team" members that have helped us get to where we are today.